What does this process look like? How do we begin? Is it even possible to live a life pleasing to God? R.C. Sproul believes it is not only possible, it is our calling. 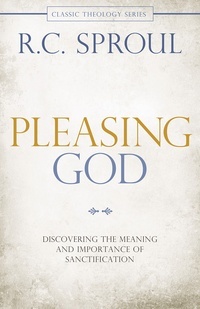 Pleasing God delivers an in-depth look at God’s plan and pathway for spiritual maturity. Clearing away the confusion of religion and dogma, Dr. Sproul reveals how every believer can experience authentic, lasting life change through a relationship with God. Rich in biblical insights, Pleasing God offers a practical guide for anyone longing to live a life that honors the Savior. This is the first book I purchased pertaining to Theology. I purchased it in the early '80's when I was 20something and it truly changed my life and gave me an insight into what it really means to live a life pleasing to God and not just call yourself a Christian. I have 3 sons now in their 20's and am purchasing this book for them.